For other uses, see Posadas. 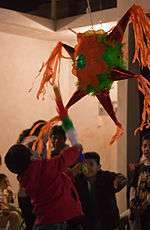 Children in Oaxaca, Mexico celebrating Las Posadas by breaking a traditional star-shaped Piñata. Spanish for "lodging", or "accommodation"; it is said in plural because it is celebrated more than one day in that period. The nine-day novena represents the nine months of pregnancy, specifically the pregnancy of Mary carrying Jesus. The ritual has been a tradition in Mexico for 400 years. 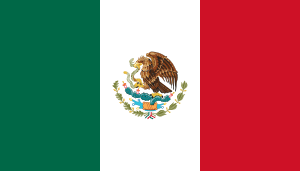 Many Mexican holidays include dramatizations of original events, a tradition which has its roots in the ritual of Bible plays used to teach religious doctrine to a largely illiterate population in Europe as early as the 10th and 11th centuries. These plays lost favor with the Church as they became popularized with the addition of folk music and other non-religious elements, and were eventually banned; only to be re-introduced in the sixteenth century by two Spanish saints as the Christmas Pageant, a new kind of religious ceremony to accompany the Christmas holiday. In Mexico, the Aztec winter solstice festival had traditionally been observed from December 7 to December 26. According to the Aztec calendar, their most important deity, the sun god Huitzilopochtli, was born during the month of December (panquetzaliztli). The parallel in time between this native celebration and the birth of the Christ lent itself to an almost seamless merging of the two holy days. Seeing the opportunity to proselytize, Spanish missionaries brought the custom of the re-invented religious pageant to Mexico, where they used it to teach the story of Jesus' birth to Mexico's indigenous people. In 1586, Friar Diego de Soria obtained a papal bull from Pope Sixtus V, stating that a Christmas Mass (misa de Aguinaldo), be observed as novenas on the nine days preceding Christmas Day throughout Mexico. While its roots are in Catholicism, even Protestant Latinos follow the tradition. It may have been started in the 16th century by Friar Pedro de Gante. It may have been started by early friars who combined Spanish Catholicism with the December Aztec celebration of the birth of Huitzilopochtli. The Las Posadas text and ritual are also strongly identified throughout the Rio Grande with converso settlers. For more information see Song From a Withered Limb in the journal HaLapid, Autumn/Winter 2015. Individuals may actually play the various parts of Mary (María) and Joseph with the expectant mother riding a real donkey (burro), with attendants such as angels and shepherds acquired along the way, or the pilgrims may carry images of the holy personages instead. Children may carry poinsettias. The procession will be followed by musicians, with the entire procession singing posadas such as pedir posada. At the end of each night's journey, there will be Christmas carols (villancicos), children will break open star-shaped piñatas to obtain candy and fruit hidden inside, and there will be a feast. Piñatas are traditionally made out of clay. It is expected to meet all the invitees in a previous procession. In Puerto Vallarta, Jalisco the Vallarta Botanical Gardens hosts a Las Posadas celebration on December 20. During workshops in the daytime, participants make their own nativity scenes with local natural materials including Spanish moss. In the evening, carolers proceed to nativities that are placed among important plants including poinsettias and native Mexican pines. A bonfire and more singing rounds out the celebrations. In Wisconsin, the procession may occur within a home, rather than outside, because of the weather. An event in Portland, Oregon terminates with Santa Claus and donated Christmas gifts for needy children. In New York, worshippers may drink Atole, a corn-sugar drink traditional during Christmas. A large procession occurs along the San Antonio River Walk and has been held since 1966. It is held across large landmarks in San Antonio, Texas, including the Arneson River Theater, Museo Alameda, and the Spanish Governor's Palace, ending at the Cathedral of San Fernando. In the Philippines, which shares Spanish culture due to being a former possession, the Posadas tradition is illustrated by the Panunulúyan pageant. Sometimes it is performed right before the Misa de Gallo (Midnight Mass), or on each of the nine nights. The main difference with the original is that actors portray Mary and Joseph instead of statues, and they sing the lines requesting for accommodation. The lines of the "innkeepers" are also sung, but sometimes they respond without singing. Another difference is that the lyrics are not in Spanish but in one of the local languages, such as Tagalog. In Nicaragua the older generations grew up celebrating posadas but somehow they became extinct in big cities by the 60's. However, there is a major holiday in Nicaragua called La Gritería (The Shoutings), on December 7 in honor of La Purísima Virgen (The Purest Virgin). The Purisima originated in Leon in the 1600s with Franciscan monks but the celebration spread quickly throughout the country. By the 1800s it became a national holiday and today it has become a tradition wherever Nicaraguans have emigrated to such as Costa Rica, Honduras, Miami, Houston, Los Angeles, San Francisco, etc. The Purisima starts at noon on December 7 with major fireworks throughout the country. Then at about 6:00pm more fireworks announce the time when adults and children go out around their neighborhoods or towns with burlap sacks in hand visiting different, beautifully crafted altars while caroling the Virgin Mary. In exchange for singing people receive sweets, refreshments, fruit, toys, etc. The celebration goes on well into the night. Finally at midnight the most outstanding fireworks in the shape of Mary, stars, angels, etc. begin, lasting for half an hour. Cuba also has something similar, called Parrandas (though Parrandas has more of a Carnaval in atmosphere). The tradition began in the 18th century when Father Francisco Vigil de Quiñones, the priest of the Grand Cathedral of Remedios, in order to get the people to come to midnight masses the week before Christmas had the idea to put together groups of children and provide them with jars, plates and spoons so they could run around the village making noise and singing verses. The idea persisted over the years and with time it gain complexity ending in the street party that has remained till these days. In Colombia, Venezuela, and Ecuador, families and friends get together from the 16th to the 24th of December to pray the novena of aguinaldos. ↑ "Southwestern Christmas - Luminarias and Farolitos". Santafedecor.com. Archived from the original on April 26, 2012. Retrieved 2015-12-14. ↑ "No Room in the Inn: Remembering Migrants on the U.S./Mexico Border". Peace.mennolink.org. 2010-07-04. Retrieved 2012-11-03. 1 2 3 Erickson, Doug (2010-12-23). "Latinos here celebrate Christmas tradition Las Posadas, 'festival of acceptance'". Wisconsin State Journal. Retrieved 24 December 2010. ↑ Guerrero-Huston, Thelma (2010-12-22). "'Las Posadas' event celebrates the Christmas story". Statesman Journal. Retrieved 24 December 2010. ↑ Heller, Reid (Autumn–Winter 2015). "Song From a Withered Limb". HaLapid. XXXIII/XXXIV. ↑ Pemberton, Tricia (2010-12-15). "St. Mary's students observe Las Posadas tradition". The Oklahoman. Retrieved 24 December 2010. ↑ Candia, Pablo (2010-12-20). "Las Posadas: Passing on a Hispanic tradition in Dodge City". Dodge City Daily Globe. Retrieved 24 December 2010. ↑ Langlois, Ed (2010-12-23). "Event mixes Christmas tradition and charity". Catholic Sentinel. Portland, Oregon. ↑ McCaughan, Pat (2010-12-17). "Las Posadas observances adapt, recall Latin American celebration of the nativity". Episcopal News Service. Retrieved 24 December 2010. ↑ Fisher, Lewis F. (1996). Saving San Antonio: the precarious preservation of a heritage. Lubbock, Tex: Texas Tech University Press. ISBN 0-89672-372-0. ↑ Hoyt, Catherine A.; Simons, Helen (1996). A guide to hispanic Texas. Austin: University of Texas Press. ISBN 0-292-77709-4. ↑ Eakin, Tyra (2010-12-20). "San Antonio's River Walk offers winter wonderland". Victoria Advocate. Retrieved 24 December 2010.